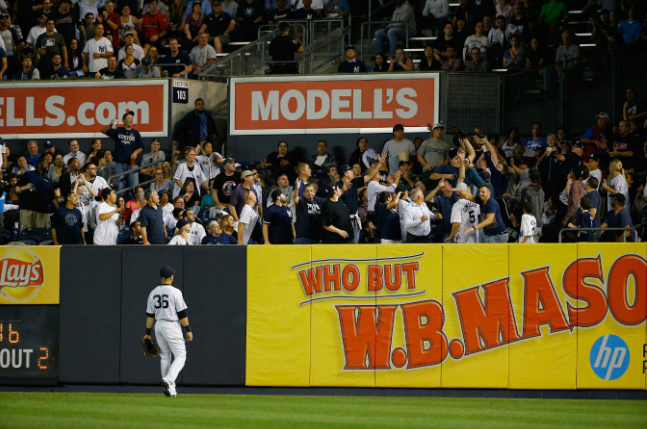 Home / All About Baseball / Major Leagues / Bronx Bombers or Bronx Bummers? What’s Next For the Yankees? Bronx Bombers or Bronx Bummers? What’s Next For the Yankees? Father Time has made a home for himself in New York. The Bronx Bombers are looking like the Bronx Bummers, as the aging Yankees seem to be falling apart a little more every year. Although the Yankees have finally gotten near .500, this is no feat to be proud of. The Yankees have historically been an elite, championship caliber franchise. With 27 World Series titles under their belt, a .500 winning percentage is a major disappointment. It’s been some time since the Yankees won a World Series- -the last one coming in 2009. Since then, the roster has changed immensely. Derek Jeter, Mariano Rivera, Jorge Posada, Andy Pettitte and World Series MVP, Hideki Matsui have all retired. David Robertson, Robinson Cano, Melky Cabrera, Francisco Cervelli, Phil Hughes and Ian Kennedy have all moved elsewhere dawning a new uniform. Well, their lucrative contracts have just eaten up the Yankees available salary without much production in return. CC Sabathia has been injured for most of the last couple years. Mark Teixeira has been injured as well and while he’s been on the field his production has been minimal- batting under .200 this season. Alex Rodriguez sat out all of 2014 due to a suspension; he had an incredible year last year, but has come back down to reality, struggling in 2016. As if that wasn’t bad enough, since the Yankees have picked up a couple more awful contracts along the way– Jacoby Ellsbury, Brian McCann, Chase Headley, and even Masahiro Tanaka. The Yankees look old, slow, their bats have been abysmal,the pitching staff looks beaten up and it won’t be until 2022 that they’ll be free of all the deals made in the past 8 years. So what’s the next move for the Yankees? Break apart the three-headed monster in the bullpen. Aroldis Chapman, Andrew Miller, and Dellin Betances had the potential to be a historically dominant bullpen, but with the Yankees struggling they haven’t really had a chance to showcase the shutdown bullpen. Chapman is the hardest throwing pitcher in the game. The left handed hurler can gas it up to 106.1 mph. When his control is there, he’s untouchable. He has been great for the Yankees thus far, but since he’ll be a free agent and the Yankees are no longer a contender, it’s time to trade him and get some value for him. Milller has been another lefty who has excelled over the last couple years. Adding him to a club would give an immediate boost to any bullpen. Miller won’t be a free agent until 2019 so that should be noted. Betances should not be on the move. He was incredible as Mariano Rivera‘s set up man and even more impressive as Miller’s set up man. It’s time for the Yankee skipper to give the man his well-deserved closer role. The Cubs, Mets, Marlins, Nationals, Dodgers, Rangers, Orioles, Red Sox and the Giants are all possible contenders that should all be in the mix for Chapman or Miller. Selling both before the deadline and acquiring top prospects in return should be a priority for the Yankees. Let Carlos belt home runs for a contender and get young talent in return. Carlos Beltran has been by far the Yankees best hitter this year. As he’s getting older in age, his decline as star has continued but is still putting up quality numbers. His veteran experience would bring plenty of leadership to a young contender. He would be a phenomenal fit in San Francisco. Beltran wore the orange and black in 2011. With it being an even year, the Giants look to win the World Series in 2016 (Giants won World Series in 2010, 2012 and 2014). Beltran would be a major asset in San Francisco. His presence in the clubhouse would make them top contenders next to the Chicago Cubs. Let the young Bird fly in Pinstripes. Mark Teixeira will also be a free agent. Yankee fans will look at the free agent market and fear that no top first baseman will be available to replace Tex. The answer lies in the farm system. They have plenty of talent there and it’s time to let the caged bird out. Greg Bird should be the starting first baseman for the New York Yankees once the 2017 season begins. Bird has been sidelined for all of 2016 after his season ending shoulder surgery. In just 46 games, Bird has smashed 11 HRs and knocked in 31 RBIs. He’s ready to be right in the middle of the line up. Let Judge slam his mallet. Aaron Judge is a top prospect in the Yankees organization just like Bird. He has drawn immediate comparisons to Giancarlo Stanton. His violent swing will make him easily one of the most exciting players in 2017 and he’ll definitely become a force in the league. By trading Beltran or letting him go in free agency, the Yankees would have an open spot in the outfield. Rather than signing someone and making another poor, lengthy signing, the best option is currently playing for the Scranton/Wilkes-Barre RailRiders. Judge is hitting .266 with 16 home runs in Triple-A– 7 of those home runs have come in his last 8 games. He’s on a tear and it’s time for him to put on the pinstripes. CLEAN HOUSE AND START OVER. Dump every possible contract. Get rid of Chase Headley, he’s been absolutely horrendous thus far. He is a quality ballplayer who has had anything but a quality season. Trade him and give him a change of scenery. If the value isn’t there, well… get rid of him anyways. If Rob Refsnyder can tighten up can tighten up his glove, start him at third. Trade Jacoby Ellsbury or Brett Gardner or even both. Bring up Ben Gamel, Mason Williams, or maybe even Dustin Fowler. Trade Brian McCann and start Gary Sanchez. The likelihood of actually clearing all the contracts is slim, but the more the merrier. The Yankees have to start from scratch and the farm is where they should start. Their dominant late 1990s era came from the Core Four — Jeter, Rivera, Posada, Pettitte (all farm system talent)– and it’s time to repeat the process. 2017 may be rough, but cleaning house and going young makes the future look bright.